So you know how to write great content, feel empowered to knock it out, and then you hit a major stumbling block- what the heck are you supposed to be writing? 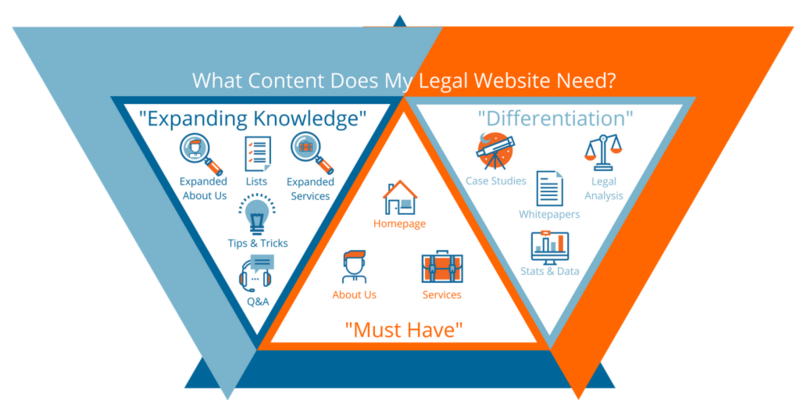 Understanding appropriate content for your law firm website can be challenging, whether you are starting from the beginning, or looking to expand your current content. The type of content that you are producing depends on where you are in the website development process. There are 3 different levels of content that you can produce to benefit your web presence and increase your conversions, however, they should be done in a specific order to produce the results that you desire. Providing high level insight into client topics without first covering the basics is the web equivalent of putting the cart before the horse. “Must Have” content lays the foundation for “Expanding Knowledge” content, which builds the credibility you need for your “Differentiation” content to be impactful. “Must Have” Content- Write This First! The first type, “Must Have”, is content that is necessary for your prospects to understand who you are and what you do on the most basic level. This includes your homepage copy, About Us copy, and information on your basic services. This is content that is required to build out your website, and will need to be completed before we can put your site live on the web. 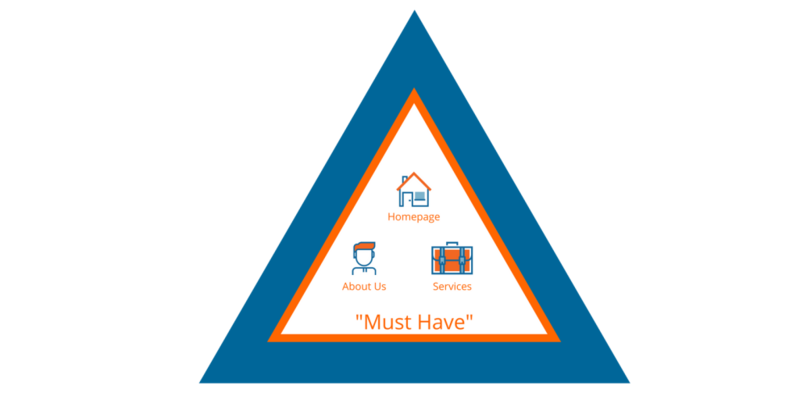 We typically start with a minimum of 3 services that you want to promote through your website, so select the areas you most want to target and write that copy first. We can always add more content and services later, but we want to start on the best footing possible. Homepage- Introduces your Firm and highlights your main services. Includes a Call to Action with contact information. About Us- Tells a story about your firm and your attorneys. Written with your target audience in mind. This should NOT be a reiteration of your resume, but more of a personal letter to a prospect on why they should select you to represent them in their legal matters. Basic Service Pages (at least 3)- Should be written as a persuasive article, as defined by our Copywriting for Lawyers blog post. The second tier, called “Expanding Knowledge”, is where you develop content that, while not necessarily required to launch your website, will help to improve web traffic and conversions, as it shows your prospects that you have more than cursory knowledge of the subject in which you are claiming to be an expert. These articles can also give a prospect more opportunities to find you through organic search. 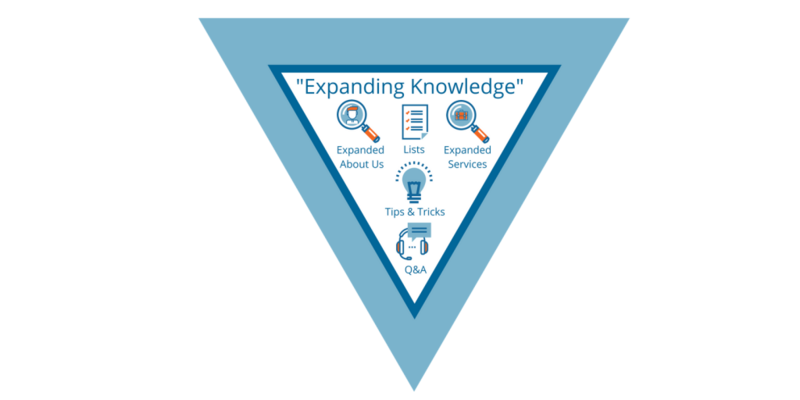 “Expanding Knowledge” often includes things such as lists, Q&A’s, tips and tricks for your clients, and expanded information on topics that are already covered in your “Must Have” section. Tips & Tricks- Do you have shortcuts, recommendations, or items that clients should be aware of or on the lookout for? People are constantly looking for ways to gain an advantage, so creating this type of content on your website can be a great way to increase your organic website visitors. Expanded Services- Often, there is more information that you want to add about your basic services, and this is a great way to quickly create additional content to prove your authority. For example, if you are a Family Law Attorney, then chances are that one of your basic service pages discusses divorce. You can create expanded information content that speaks to a specific audience, such as ‘Divorce for Business Owners’ or ‘Divorce for Families with Children’. It may also expand on a component of the topic, such as ‘Understanding Alimony’ or ‘What Assets are Divided During Divorce’. Question & Answer Style Information- Most businesses have a set of questions that they commonly have to answer for clients. These are also many of the same questions that prospects are researching online. That means that producing this kind of content can help them find you when they are looking for answers, and can help to further educate a prospect so that they are more prepared when they do reach out for assistance. This can be accomplished either as a single Q&A page, or can be broken down into several individual articles. Lists– People inherently love the organization and clean layout of lists, making this a highly-shareable type of content. There are many topics that you can create lists around, based on your legal niche. An Employment Attorney may produce lists such as ‘5 Signs Your Employment Agreement May Be Outdated’ or ‘7 Ways FMLA Protects Your Employment’. There are many legal topics that lend themselves well to this type of article. Expanded About Us- “What To Expect When You Work With Us” This article is intended to provide more information about your firm, and helps a prospect understand the onboarding and initial consultation process. It can discuss items such as what to expect from their free consultation, what to bring to their first meeting, and the ways that you protect their privacy. This type of content allows a prospect to gain a sense of comfort in what they can expect from you and your firm, and can make conversion to a client much more fluid. 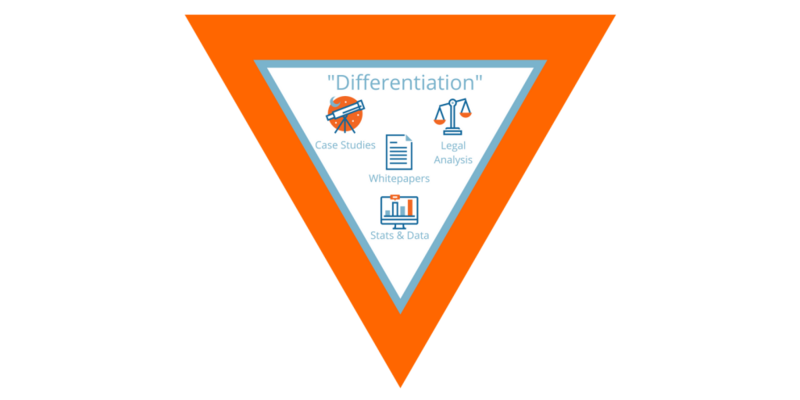 The third tier, “Differentiation”, is content that truly sets you apart from your competitors and defines you as an expert. This copy delves much further into real issues, and often includes analysis of real world situations, or provides expert opinion on very specific ideas and topics. This content may be too complex for many of your readers to fully comprehend, and that is perfectly fine. The intent of creating this type of copy is not to educate readers, but rather to impress upon them the depth of knowledge that you possess, and to position yourself as a true expert in your field within the legal community. This level is all about building trust. Case Studies- In-depth analysis of cases that you have worked are fantastic content pieces that can add a huge amount of value to your website. They not only highlight your expertise in your field, they also give a prospect comfort that you are able to do what you are claiming. It also works on an emotional level, where the prospect feels a connection to the story, and thus subconsciously relates your story to their personal story, and imagines how you could get similar results for them. Whitepapers- Whitepapers are the business world equivalent of a college research paper. These are typically an in-depth look at a specific issue that you are a specialist in. Professional and serious, these are not light reading. They are intended to provide a deep dive and depth of information that blog posts do not. For example, you may have a blog post about Florida Divorce that covers the basics, whereas a whitepaper may have extensive information regarding all aspects of obtaining a divorce in Florida, references to Florida Statutes, and an analysis of the efficacy of the divorce process in Florida. Analysis of Legal Matters in the News- There are always plenty of news items that are related to legal matters, so why not utilize these to show your expertise? Analyze cases that have media-heavy attention, or write articles related to how you would handle a case if you were the attorney in a given situation. For example, a criminal lawyer may take a current trial and give their analysis of how the defense strategy is working, what they predict the next steps will be, or how they would handle the case if they were the attorney. Original Statistics & Data- Facts and statistics are as compelling as they are irrefutable. People love the certainty of statistics, and compiling your own statistics can be an interesting activity that can provide you with expert-level content. This can often be done simply by taking research that has already been performed and creating subsets of data. For example, a divorce attorney may take national divorce statistics and break them down into states, counties, or cities, or may break them down by reason provided for dissolution. Statistics are so compelling because they give people the opportunity to compare themselves to the norm, or help them to feel that they are part of a larger group who is experiencing the same things they are. How Often Should I Produce New Content? Basic content needs to be created when we initially launch your website, but can be updated, expanded, or edited at any time. Beyond that, how much and how often you add content to your website is completely up to you. There are lots of differing opinions on how often you should produce content, from daily to monthly. Our professional opinion is that the quality of your content is more important than the frequency. If you are only able to produce one good, quality article every two months, that has more value than several articles with little substance. When you produce new content for your website, let us know! Our system automatically syndicates your new content to your linked social media accounts, but there is a lot more we can do! We can not only use fresh content to help promote your website, we can give you recommendations for other uses for the content, from syndication to outside blogs/resources, to suggestions for creating lead capture campaigns targeting prospects who would be most interested in your content. Quality content can do more than simply improve your website, it can be a powerful tool for finding prospects and converting them into clients! If you need assistance creating content, generating content ideas, or want to discuss a content strategy with one of our experts, give us a call at (877) 721-8491. We will be happy to review your current content and assist you with creating a plan for future content development. Still looking for content ideas? Check out The Big List of Content Topics for Family Law Attorneys for 100 questions you can answer on your website!